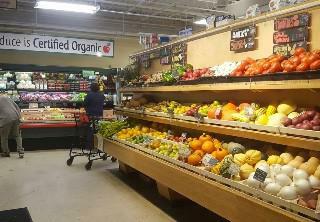 MOM's Organic Market is a chain retailer of organic produce, raw foods, natural remedies and cosmetics, and more. It is environmentally conscience and offers local, seasonal foods, and all produce is 100% organic. They offer electric charging stations and an extensive recycling/composting center. Small, friendly, and there is an discount available for bringing your own bags!